In the territories of Amazon rainforest, from Brazil to Peru, Colombia, Ecuador and Venezuela Ayahuasca, known as vine of spirit or vine of death, has been known for the centuries if not millennia. 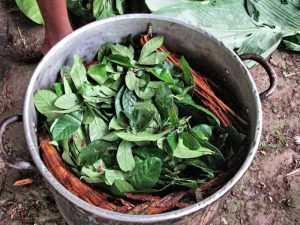 Along with many other plants and their preparation techniques, Ayahuasca brew makes a major part in Amazonian plant tradition. Its millennial use in ritual context appears as continuing element in traditional Amazon spiritual culture. It’s believed to opening perception to other worlds, dimensions, where a healing through accessing hidden parts of ourselves gets within our reach. Ayahuasca (Banisteriopsis Caapi) is the name of the vine, used in preparation of Ayahuasca tea, where also other admixture plants are added, most common being the Chacruna (Psychotria Viridis). Together these two main ingredients create one of the most powerful and magic decoction, used in sacred rituals or ceremonies, were everybody drink the tea with a purpose of receiving the healing, insights and guidance. Based on numerous research results Ayahuasca brew has no demonstrated toxicity, thus having no adverse effects on basic physical functions. The main active compounds of dark brown jungle tea are harmine, harmaline, coming from thevine, and dimetiltriptamine (DMT), absorbed from Chacruna leaves or sometimes analogous admixtures like Jurema (Mimosa Hostilis). The vine is mainly responsible for the part of purgative, emetic effect of the brew, whereas the DMT is the one that is responsible for visions. As for the psychoactive element, DMT is the most common element in the nature, also being produced in human brain. Based on the works of acclaimed author Rick Strassman, he shares in his book “DMT: Spirit Molecule” that DMT is responsible for many psychological and spiritual processes like dreams; peak emotional states and is also common molecule found through Earth’s vegetation. Ayahuasca was traditionally used for inner healing, divination and to gain wisdom about broader reality. 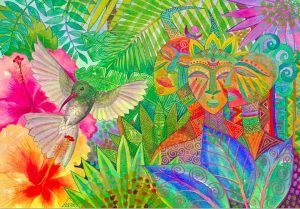 The experience with Ayahuasca is characteristic of profound insights about Nature, society and broader reality. The journey or the process with this ancestral medicine is one of seeing the and reconnecting with one’s innermost nature, seeing own conditions and self discovery for transformation. Ayahuasca ritual is the stage on which we can approach and challenge our limits, get inspired to study our mind. Ayahuasca ritual is like transpersonal training grounds. The experience reveals more layers of self, makes us more sensitive ourselves and others, result of which can be anywhere between a fresh approach to daily challenges, honesty with oneself and to discovery of possibilities unknown before. After assuming Ayahuasca, person experiences peak states with amplified senses, feelings and emotions perceiving surroundings more vividly. Its necessary to note that many parts of us may surface, so its crucial that one approaching Ayahuasca comes clear with oneself. When practitioner is willingly open for authentic self inquiry, Ayahuasca acts as a true medicine for the soul. Actualises blocked and painful areas of Mind through re-living of past trauma, violence, stuck emotional patterns, dysfunctional relationships etc..
Amplified vision outwardly and inwardly displays a sharp perception and visual interpretations of inner processes. The experience may increase to higher intensity and have cathartic expressions or remain on an inner display as a dramatic teaching. Comprehension of element of balance being a natural basic prerequisite for living in harmony. Allows to see our habitual ways and their impact on our life. In an expanded state Ayahuasca shows different perspectives and alternative ways on even very difficult issues. Answers for solution or at least how to make a step closer. The qualities of spaciousness, vividness and depth becomes the very ground of experience, suggesting to explore what would it take to awake these qualities as basic modality of mind.